The Anime Festa in Tokorozawa, running July 26 to September 28 with the theme “Sky, Science and Technology”. The event was organized by the Japan Science and Technology Promotion Foundations and have fans from Last Exile, Ghost in the Shell Arise, Psycho Pass and others Sci-Fi animes. 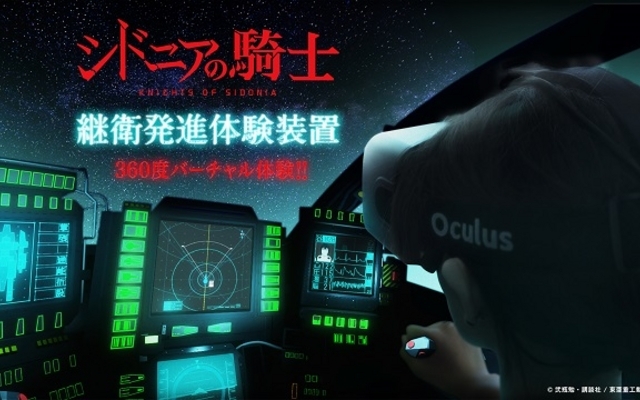 The Event this week has introduced 『シドニアの騎士』, Knights of Sidonia, based on the opening from Sidonia‘s anime adaptation, that became the centerpiece to the visitor because , the 360° experience puts the viewer into the cockpit of a Tsugumori using the Occulus Rift DK2 headset and the 5.1ch surround sound from the anime’s Blu-ray release.